I’m proud to work in Tennessee education. Our state has done the challenging work of implementing policies that prioritize what is best for students, and that focus has led us to be one of the fastest improving states in the nation in education. Educators, policymakers, and leaders share a firm belief that our students are just as capable as any in the country, and all Tennessee students deserve bright futures. I’m also particularly proud because teacher leadership isn’t just a buzz phrase or a passing fad here—it’s part of the fabric of how we operate. 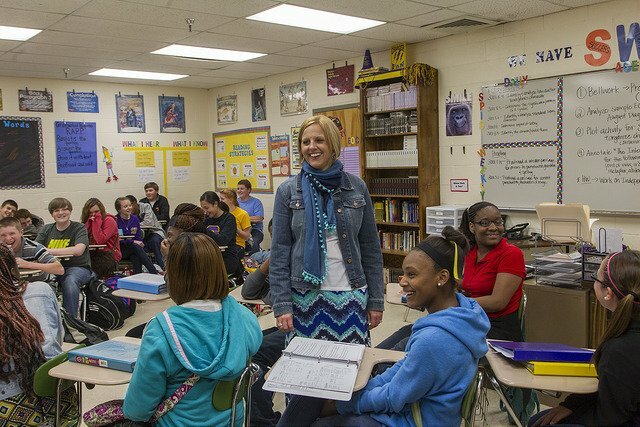 In our state, there are countless opportunities for educators to lead beyond the classroom. Recognizing the value of educator leadership beyond the classroom level is important because teachers are the closest to students and involving them in the policymaking process ensures that students are at the heart of what we do. Since 2014, SCORE’s Tennessee Educator Fellowship has provided educators the opportunity to learn about policy and become strategic advocates for their students. In a year-long term, educator fellows grapple with the complexities and nuances of education policy and learn how to be strategic advocates for the policies and practices that put students first and advance the progress in Tennessee. Look under the hood. Fellows learn deeply about the recent history of education policy in Tennessee. They engage with key leaders to understand the current policies and programs in Tennessee that guide our work. Fellows have the opportunity to ask tough questions, of themselves and others, and share their perspectives about what is best for kids. They become leaders in their schools and districts, sharing their critical learning with colleagues and the community. Think outside their own experience. Being in the Tennessee Educator Fellowship means being a member of a diverse cohort of educators with unique experiences and perspectives but with one important commonality – a clear focus on all Tennessee students. Fellows enjoy the camaraderie and support that a cohort experience brings, but more importantly, fellows challenge one another to grow as learners and advocates. Fellows are challenged to think outside their own experience: to learn the why behind the policy and how it can be a lever for change at a systems-level. Lead beyond the classroom. The Tennessee Educator Fellowship recognizes that educators can be an active part of policy conversations—and they can lead the conversations too. Fellows’ advocacy is informed by their own experiences and grounded in a steadfast belief that all students deserve access to a high-quality education. Being a student-centered advocate is about more than having a seat at the table and sharing your individual perspective. It’s about identifying a need in your community, and then leading the way to address that need. Educator fellows lead their own advocacy work to connect with policymakers and collaborate with other educators to promote the policies and practices that are best for students. SCORE is currently looking for the next cohort of Tennessee Educator Fellows. If you are a Tennessee public school teacher, librarian, interventionist, or school counselor with at least three years of experience teaching in a Tennessee public school by May 2019 and want to lead change for Tennessee students, we invite you to apply to become a SCORE Tennessee Educator Fellow. Applications for the 2019-20 Tennessee Educator Fellowship will be accepted through Tuesday, February 26, at 11:59PM (CST). If you support the success of Tennessee students and teachers, we ask that you share this opportunity with the educators in your network. SCORE looks forward to working with another cohort of fantastic educators who will move Tennessee students forward. Leigh Cooksey is the educator engagement associate at SCORE.